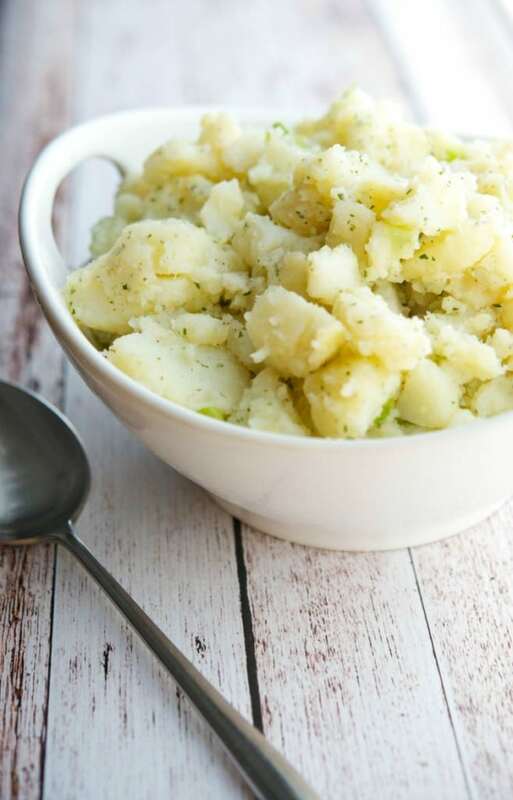 Zesty Ranch Potato Salad made with russet potatoes, scallions, Hidden Valley Ranch Dressing packet, oil and vinegar makes a great addition to any picnic. 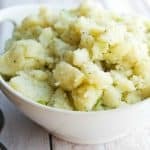 I love homestyle, mayo based potato salad; however, my daughters and niece aren’t fond of it (or anything with mayonnaise for that matter!). 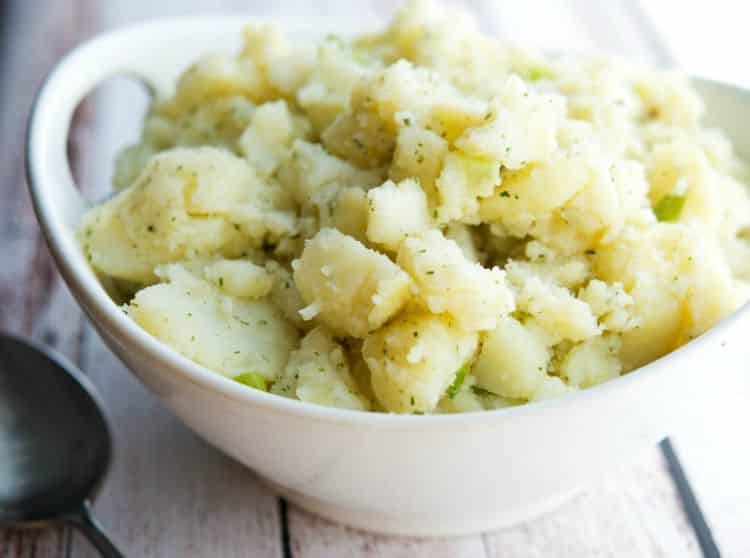 So when I recently hosted a impromptu family bbq, I decided to try a new potato salad recipe without mayonnaise and came up with this Zesty Ranch Potato Salad. 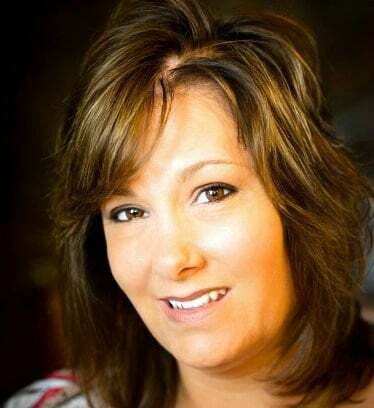 I didn’t have a lot of time to get food together and found a packet of Hidden Valley Ranch dressing in my pantry. I combined it with white vinegar and Canola oil; then tossed it with cooked potatoes and chopped scallions. SUPER SIMPLE and gluten free as an added bonus. I used russet potatoes because that is what I happened to have on hand, but red bliss potatoes would be nice to give the salad a little color as well. What this recipe lacks in robust, vibrant color, it certainly makes up for in taste. 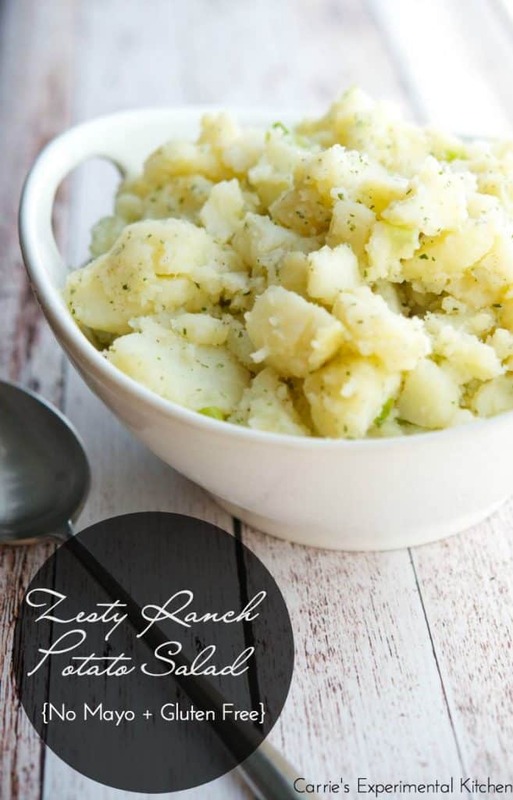 This Zesty Ranch Potato Salad was so good and very light. Everyone really liked it; including my daughters and niece. One of the things I like about non-mayo based potato salads is that you don’t have to wait as long for the dressing to soak into the potatoes so this was ready to eat almost immediately. Serve it at room temperature for a German-type potato salad or refrigerate for about 2 hours for a cold salad. ~Enjoy! Drain the water and fill the pot with cold water several times until the potatoes have cooled enough to peel them. Peel the skins from the potatoes, cut them in chunks (or slice them) and place in a large bowl and add the scallions. In a small separate bowl, combine the Ranch dressing, vinegar and oil. Pour the dressing over the potatoes and mix well. Cover and refrigerate for 2 hours for a cold salad or leave covered at room temperature. This recipe serves 10-12 people based on having other salad/side offerings at a picnic. If this is your only side dish, it will be enough for 6-8 people.